If you’re like me, you’ve had an iPhone, iPod Touch and/or iPad for a few years now and have probably amassed a fairly big collection of apps, both free and paid. Until last year’s iOS 5, this meant having to keep a local copy of each and one of them on the computer you used to sync your iOS device. My “Mobile Applications” folder contains 924 items, weighing a whopping 18.78 GB. iTunes only lists 920 apps, so something is out of sync already. Obviously, I do not use that many apps. My iPhone 4 only has 163, and I could delete many of those as I don’t use them. My father’s iPad, which uses my Apple ID to get apps so that he doesn’t have to purchase the same ones I have already paid for, has about 250, most of them being games he tried once or twice and left there. I’m about to phase out my glorious 2006 iMac in favor of a new Mac Mini and I’m going to just move the iTunes Library folder; this way, everything is retained and I don’t have to convince a brand new iTunes not to nuke the iPhone and iPad just because they have been synced to a different machines. As for the music itself, I could also use iTunes Match to carry it over, but I’d rather just drop the folder in and be happy about it. The point is that I really don’t want to waste about 20 GB on the new computer for apps I honestly don’t care about. The most immediate method, deleting the apps from iTunes, kind of works… except that if you delete an app that’s used on your device, it will be removed from that device upon syncing. The proper way to do this would be to manually delete from iTunes the ones you’re not using. There’s a little problem with that: there is absolutely no way of knowing whether any local app is being synced to any device or not, unless you manually check whether every single app is on any of your devices. This sounds dreadful enough with my iPhone, with which I’m very familiar; doing it with my father’s iPad sounds like a nightmare. Thankfully, after a little searching, I found the way to do it in a much easier fashion. Of course, if you follow these instructions and you delete important data or things like that, I’m not responsible. Do this at your own risk. I’m using iTunes 10.7 on OS X 10.7 Lion, but it should be the same on OS X 10.8 Mountain Lion. When iTunes 11 is released in a few days or weeks, it’s probably going to be much different. The first, very important thing to do is to disable automatic syncing. To do this, open iTunes’s preferences, go to Devices, and check Prevent iPods, iPhones and iPads from syncing automatically. You can do this even when your device is not connected, but I recommend doing this when it’s already connected so it’s even less likely that something goes wrong. After you’ve made sure that the new device does not start to sync automatically, go ahead and run a full backup, just in case something goes wrong. Find your device in the sidebar, right click on it, and choose Back Up. It will take a while. After it’s done backing it up, it’s time to rock and roll. Click Apps in the the Library section of the side bar, and either choose Select All from the Edit menu, or hit Command-A on your keyboard. Now all your bazillion apps will be selected. You can either delete them, which I do not recommend, or you can move them to a folder. With all of them selected, just drag them into a folder you previously created with the Finder to make a manual backup of all of them. Again, it will take a while. Once all the files are safely copied, you can delete them: just press backspace on your keyboard, or choose Delete from the Edit menu. At this point your may get a scary message warning you that the apps will be deleted from all devices to which they had been copied. Confirm the deletion and move to trash; that’s why you just copied them out. Now, here’s the nice part. With your device still connected, right click on its name in the sidebar and choose Transfer Purchases. You may be asked for your Apple ID password, and iTunes will make a local copy of all the apps that are currently on your device. Rinse and repeat for any other extra device, and you’re done: at the end you will only have a local copy of the apps that you currently have on your devices. If you want to be extra sure that everything has been copied correctly, you may want to run Transfer Purchases again for each device. At the end, you can safely re-enable automatic syncing. If you start the syncing procedure immediately, it should not copy (nor delete!) any apps in any direction, meaning they are already synchronized. At this point, if you want, you can delete the backup folder you had copied your apps to when you began this whole ordeal. I’d suggest keeping them on a backup disk just in case, but unless the apps are pulled from the App Store, you can safely download them again at no extra cost at any time. Personally, I ended up recovering about 13 GB by doing this. Not bad, considering that from my point of view those 13 GB were filled with pointless fluff! 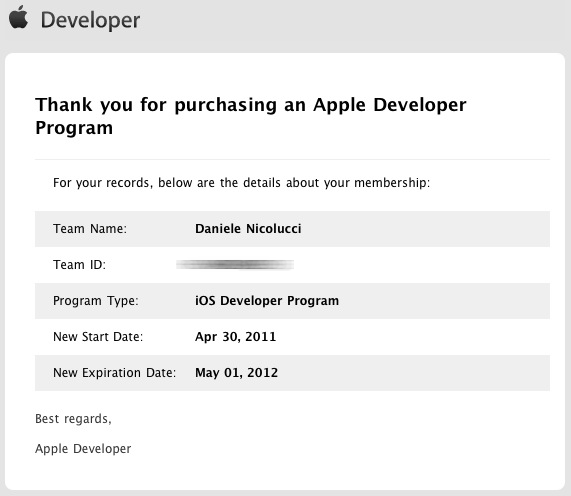 Earlier today, I joined the iOS Developer Program. After paying my entry fee and patiently waiting for about an hour for the meticulous Apple Robots to type an e-mail, I am now a registered iOS Developer, ready to attack, besiege, seize and conquer the App Store. I am currently targeting iPhone/iPod Touch only, reserving plans to expand to iPad land for later, after feeling the waters. Stay tuned for updates. I plan to start writing on this blog again soon. Could iOS 4.1 be released on Wednesday? Apple will hold a music-related event on Wednesday, September 1st. New iPods will be introduced, as it happens yearly. There is strong evidence of a new iPod nano based around the 3×3 cm touch screen seen earlier this year, and possibly a new iPod Touch with 3G data capabilities — essentially a smaller iPad. This leads me to think that these new units may require iOS 4.1 at minimum, and the new firmware could therefore be made available to iPhones (and older generations of iPod Touches — ok now that’s a weird plural) on the same day. Of course, the new units may be shipped with a particular version that won’t be made available to other devices, as it was with the iPad: iPhone OS 3.2 was never made available for iPhones, and iPads won’t see iOS 4 until the fall. Apple may also release iOS 4 for iPad on Wednesday, or give a release date. Or perhaps introduce iPad 2 whilst lowering the price of the current iPad, probably giving a refund to angry customers (it has already happened with the original iPhone.) Besides, Apple would get to use the line they love so much: our competitors are still trying to copy version 1, and we have already released version 2. Personally, I don’t care what new hardware is on the horizon. I just want iOS 4.1 for the iPhone and I want it to make my 3G decent again. One day after the release of the iPad in the United States, reviews are pouring onto American and foreign websites alike. For every person who is amazed by the device, there is someone who is bothered by the Apple buzz. To these I say: what’s the big deal? I happen to live in the Province of the Empire, in a country I oftentimes call “the third world of technology.” No way to rent movies online – or through the mail, for that matter –, no Pandora.com or Last.fm to easily find new music (the latter is available on a paid-membership basis; the former is simply forbidden), no iBooks when the iPad comes out, and so on. I live in Italy. I am also a happy Mac and iPhone user. Not an evangelist, not anymore at least: I will praise how durable and enjoyable Apple products are, but I won’t urge anybody to buy them. I will, however, talk about them to people who ask me. After close to ten years as a Mac user (I do remember MacOS 9.2 and MacOS X 10.0) and years of previous experience with Linux systems, Apple has become an invaluable provider of my daily computing. OS X allows me tinker with the underlying UNIX system with ease while being extremely user-friendly with the rest of the user interface. As a web developer, it’s the closest thing to perfection I can think of. A few days later, however, an article on a blog shone light on the matter: most of us computer people probably wouldn’t have much for a device like that. I’d personally much rather use my 13-inch MacBook Pro rather than an iPad, as it’s a full-fledged computer onto which I can install any program I want, with which I can multitask and that has a physical keyboard. I do sometimes use my MBP on the sofa, and while I agree that it’s not the most perfect experience, I’m willing to trade comfort for power.